On June 17, 2013 I turned 29 years old. In the weeks that followed, I knew I wanted to start a 30 Before 30 challenge. I just couldn't decide what to put on my list. I didn't want to read other people's lists and add random things to mine just because that's what others were doing. So I sat around for almost two months and thought hard about what I wanted on my list. I wanted to include things that I had never done or experienced. I wanted things that I needed to work on and things that I've always thought about doing but just hadn't taken the time to do. So after much thought, this is the list of 30 things that I will be trying to accomplish before I turn 30 years old on June 17, 2014. 3. Learn to quilt or sew. 4. Ride in a hot air balloon. 10. Hike a section of the Grand Canyon. 11. Make an emergency bag. 13. Go to a shooting range. 14. Learn how to take a compliment. 16. Finish the white bedroom quest. 17. Do an anonymous good deed/pay it forward. 19. Volunteer for a charity or donate money. 24. Paint two oil paintings. 25. Buy only gas and food for 30 days. 26. Tour the Hoover Dam. 27. Watch the entire Sopranos Series. 30. Get a tattoo. (Don't freak out yet mom). I didn't know that you didn't have your ears pierced? You should definitely do it! Love it! I've done Hoover dam. I didn't find it all that exciting. I want to go to that winery too! I have to same I'm excited for the tat one! Love it..the tattoo is my fav. For going outta state come to ks!! I can't believe you don't have your ears pierced. Was it that your mom never let you, or you just never wanted to growing up. And yes, you have to visit the redwoods! I love being up in the mountains, and there's really no excuse, at least in my opinion, while you're so close to them! This is an awesome list! I hope that its a beautiful SF day when you walk across the GGB! 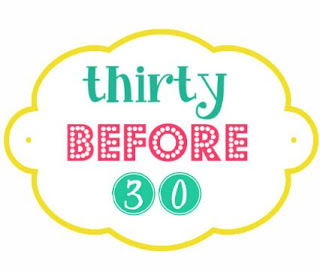 I just turned 29 too on August 8th and my very next blog post (hopefully today) is going to be my 30 before 30 list - we have a couple of things that are the same or pretty similar! My poor little blog has been neglected this past month but I'm hoping with introducing my list I will be inspired to blog more - we should help keep each other accountable! I think it's so fun that you are giving yourself a year to do all of these and that you really thought about it. I'm surprised for someone who loves accessories so much that you don't have your ears pierced.